It is really an exhilarating thing to switch from an old phone to a new one. But every coin has two sides. One of the most boresome aspects of changing phones is transferring data from an old phone to your new favorite, especially when you need to transfer contacts between Android and iPhone, which are totally different OSes. Contact is indispensable during the phone use for communication with your friends and families, so you must make sure all of your contacts are transferred to the new device. In the past, you may have to type these countless names and phone numbers to your new phone, but now technology can change the situation. 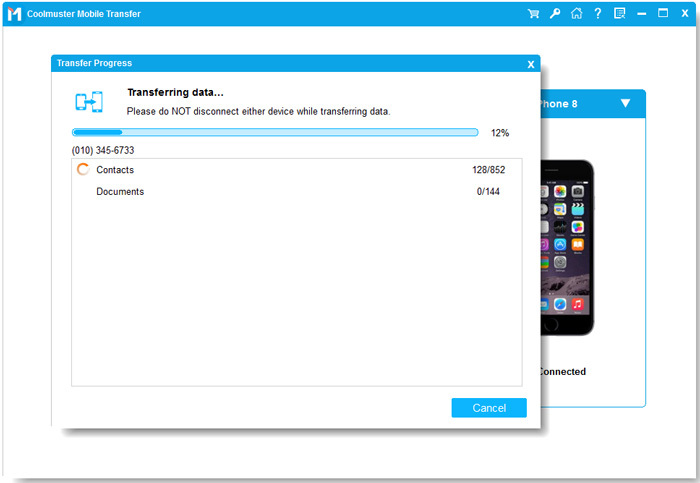 It is possible to transfer contacts between phones with one click, no matter you use Android, iPhone or Nokia! 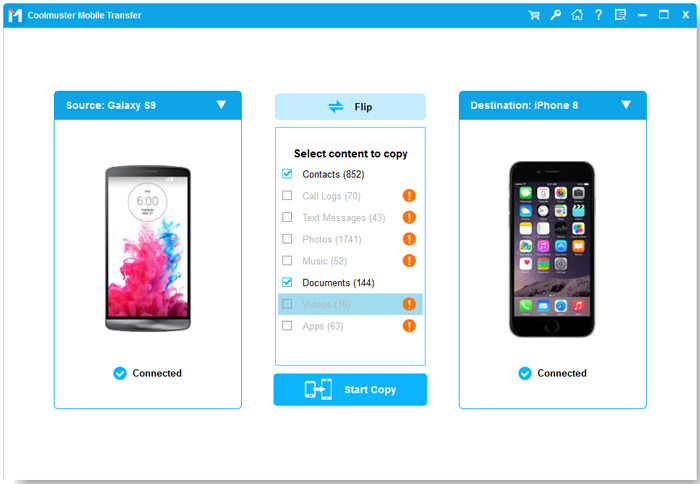 Coolmuster Mobile Transfer is a Windows based application for smart phone users to transfer data between devices which even support the different OS, such as Android to iPhone, iPhone to Android, iPhone to iPhone and Android to Android. Not only contacts, but also text messages, books, photos, music and videos can be transferred between Android phone (Samsung, HTC, LG, ZTE, HUAWEI, etc.) and iPhone (iPhone X/8/7/6) without any limitation. You can read the tutorial below to see how to perform the contacts transference between two phones exactly after installing it on your computer. We also kindly suggest that the Mac version of the program is also available, which features the same powerful functions as the Windows version. Why Does the Phone Data Transfer Stand out? Maybe it is not so newfangled to get the phone contacts transferred, but Android to iPhone Transfer is fully able to perfectly preserve the detail contact information like email address, job title, company, etc., and transfer them all to your new phone if you transfer phone contacts. You never need to worry about phone data loss issue because this data transferring software is so marvelous that everything you copy to another phone will be 100% same as the original, what you see is what you get! With the help of the program, everything can be transferred between two mobile phones, no matter which operating system your phone supports. Just free download Android to iPhone Transfer by clicking the following buttons and then follow the instructions below to copy contacts between iPhone and Android mobile phone. After downloading and installing the Android to iPhone Transfer software, double-click on the program shortcut icon on your computer desktop to get it launched. In the primary window, you should connect the two phones to enter the target window. Connect both your Android mobile phone and iPhone to the computer with the help of the USB cable. Within a few seconds, the program will detect out your devices and you will get a window as below with both the phones are displayed. Scan the files from the source phone to make sure what you want to transfer. For example, if you want to transfer contacts from Android phone to iPhone, you should uncheck any other files except "Contacts". Then, click "Start Transfer" to make all the contacts transferred from phone to phone even in different operating system. There will be a pop-up dialog telling you how the transfer is going. You just make sure that your phones are well connected to the computer during the process. My Contacts Backup is an app that helps you transfer contacts from your iPhone to Android. It comes in free and professional versions. With its help, you can backup and restore contacts from your phone easily and conveniently. This application will send contacts as a vCard file, which can be recognized by the Android devices. So you don't have to worry about incompatibility issue between the two different phone systems. What you should do: With the help of My Contacts Backup app, you can email the contacts in your iPhone to yourself and restore contacts from the backup files. After you have emailed the contacts from iPhone to yourself, you can download the contacts to your Android phone. It's as simple as that. iCloud is a cloud storage service developed by Apple Inc. and used for Apple products only, such as iPhone, iPad and iPod touch. It can be used for Apple users to back up call logs, contacts, messages, notes, photos, videos and other important content. Here, we will show you how to use iCloud to export iPhone contacts to Android devices without any problems. 1: Visit the iCloud website. Enter your "Apple ID" and "Password" and click "Login". 2: After successfully logging in, you will see some applications. Click Contacts to see all your saved contacts. 3: Select the contact you want to transfer. You can select contacts one by one or all. 4: After the selection is complete, you can click Export vCard to export the contacts you have selected to a vCard file. 1: Switch to your Android device and click on the "Contacts" icon. 3: Find the vCard file you saved above, select it, and then click the "Import" button to import this vCard file into your Android device. Step 1: Download the latest version of iTunes on Apple's official website, install it on your computer and launch it. Step 2: Connect your iPhone device to your computer via the USB cable. Step 3: After the iPhone connection is successful, it will be recognized by iTunes. Then you can click on your device in the left sidebar of iTunes, click on the "Summary" page > "Info" tab. Step 4: After completing the above steps, you will need to select "Sync Contacts With" and choose Google Contacts. Step 5: Now sign in to your Google Account with your username and password. Please note that this Google Account is required to be associated with your Android device. Step 6: Finally, click on "Apply" to make changes. Turn to your Android device and sync Google account contacts to get all the contacts on your iPhone device.